Objectives: The aim of the present study was to evaluate the prevalence and severity of dental caries school children in the Gulf Cooperation Council (GCC) area, to help the development of systematic approaches for preventive oral care programs in the GCC states and to provide sound information for oral health promotion and public health care. Materials and Methods: A comprehensive search to identify both published and unpublished articles concerning relevant studies of dental caries in children aged 6–16 years for their permanent teeth published from 1992 to 2016 with no language and time limit was performed. The search strategies employed electronic databases and incorporated both dental subject headings and free-text term. Results: The overall mean decayed, missing and filled teeth in the permanent teeth was 2.57, and the prevalence was 64.7% in the GCC area. Conclusions: Most of the studies were conducted in the Kingdom of Saudi Arabia. The results may not be a true reflection, and other countries in GCC are urged to study the prevalence and severity of caries in their children population. Dental caries is a progressive, irreversible microbial disease affecting the hard tissues of the tooth. It is the most prevalent chronic disease affecting the human race and is painful, expensive to treat and can cause harm to nutrition and overall health. Once it has occurred, its manifestations persist throughout life even after the lesion has been treated. It affects both genders, all races, all ages, and all socioeconomic groups. Caries can cause pain, which varies in severity, but has the potential to compromise the quality of life of affected children. Caries may not only result in disfigurement but also have deleterious effects on future dentition. It is a widely established fact that dental caries is an infectious disease induced by diet. The main etiological factors causing this disease are cariogenic bacteria, fermentable carbohydrates, a susceptible tooth (host), and time. In children, dental caries is particularly critical because even the following repair, the affected tooth structure exhibits increased vulnerability to damage. The mechanism of the caries process leads eventually to cavitation of the tooth structure. As a result of the fermentation of carbohydrates, organic acids are produced by oral bacteria, including lactic formic, acetic, and propionic acids. These acids are able to penetrate dental tissues and dissolve the enamel forming the outer layer of the tooth, together with the underlying dentin and the cementum which forms the root of the tooth. The erosion of substance can lead, in time, to cavitation. Usually, the examination for dental caries is performed after teeth have been air-dried, under artificial light and with the aid of a dental mirror and an explorer which is used for the removal of plaque. The number of teeth with caries is recorded for each patient. All erupted teeth are evaluated according to the criteria recommended by the World Health Organization (WHO) using the decayed, missing, and filled teeth (DMFT) index for permanent teeth. There are limited numbers of studies carried out in the Gulf Cooperation Council (GCC) states regarding the prevalence of dental caries, therefore more studies are needed to more clearly understand the status of caries in this region. The format of a systematic review is very effective in collecting a large amount of data and analyzing it simultaneously. Examples of GCC states caries status can be seen in studies that have assessed the national prevalence of dental caries and its severity in children in the Kingdom of Saudi Arabia (KSA) and the United Arab Emirates (UAE). Farooqi et al. in 2015 examined 711 KSA children aged 6–9 and 10–12 years and reported prevalence rates of 78% and 68%, respectively. In 2014, Bhayat and Ahmad. studied the prevalence of dental caries and mean DMFT in 360 12-year-old male children in Medina City, KSA. The mean DMFT score was 1.53, whereas the prevalence of dental caries was 57.2%. Al-Agili and Alaki in Jeddah, KSA reported a prevalence of 83.13% in 1655 children aged 9 and 14 years. Although in the UAE, the prevalence of dental caries was very high in children, the prevalence rate was 54% for 12 years and 75% for 15 years old, in a sample size of 2651. Therefore, the main objective of this systematic review is to identify the prevalence and severity of dental caries in school children in the GCC area, to assist in the development of systematic approaches for preventive oral care programs in the GGC states and provide sound information for oral health promotion and public health care. In June 2016, a literature search on the prevalence of dental caries in GCC countries was conducted at the Hamdan Bin Mohammad College of Dental Medicine, Mohammed Bin Rashid University of Medicine and Health Sciences (MBRU). Studies identified by database searches including PubMed, Google search, and hand searching of journals and gathering of unpublished reports. Conference proceedings were outside the scope of the review. The PubMed database and Google search were conducted using the search by key words as follows dental caries, child, prevalence, DMFT, dmft, and GCC countries (Bahrain, Oman, Kuwait, KSA, Qatar, and UAE). The search included all literature published in English and Arabic from January 1, 1992 to June 30, 2016. The titles, authors, and abstracts from all studies identified were printed and reviewed independently on the basis of keywords, title, and abstract by two reviewers to determine whether these meet the inclusion criteria. The protocol was approved by the Research and Ethics Committee of MBRU. Search results showed 191 published, which had text terms “dental caries,” “prevalence,” and “DMFT” in the title or abstract. Then, inclusion criteria were applied to the 193 searched articles and subsequently 120 were excluded due to them being non-GCC studies. From the 73 studies that remained and were assessed in full-text 51 were excluded for various reasons (five studies duplicates, five studies due to the mixed dentition, two studies unfit children, one study investigated specific teeth and 38 studies due to the age investigated being above 16 or below 6 years of age [Figure 1]. 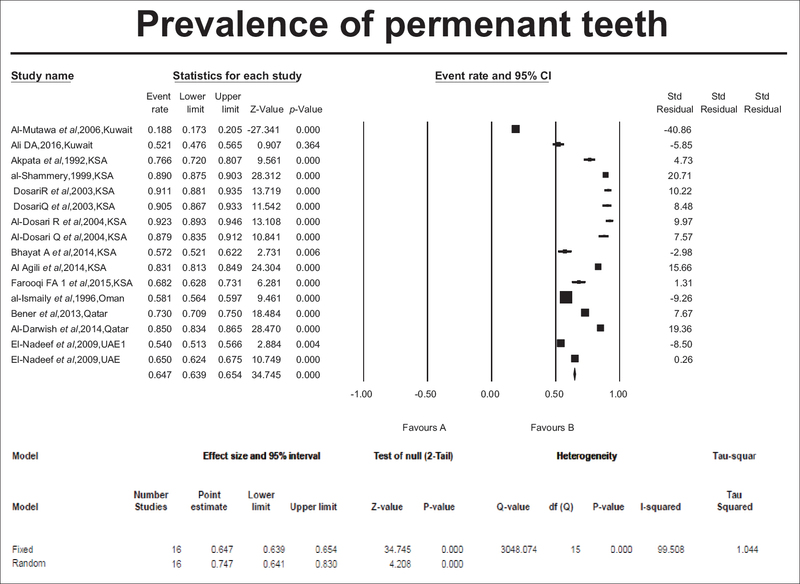 Data extracted from the 22 studies included information for permanent teeth caries (prevalence and DMFT data) [Table 1]. The overall prevalence and severity in different studies were expressed as standardized values (i.e., the standardized mean difference) together with the relevant 95% confidence interval (CI), to enable quantitative synthesis and analysis. The random effects methods for meta-analysis was used combining data from studies that reported similar measurements in appropriate statistical forms,, since they were expected to differ across studies due to differences in study populations, sample size, and study design. All analyses were carried out with comprehensive meta-analysis software version 2.2046 (2007 Biostat Inc., Englewood, New Jersy, USA). 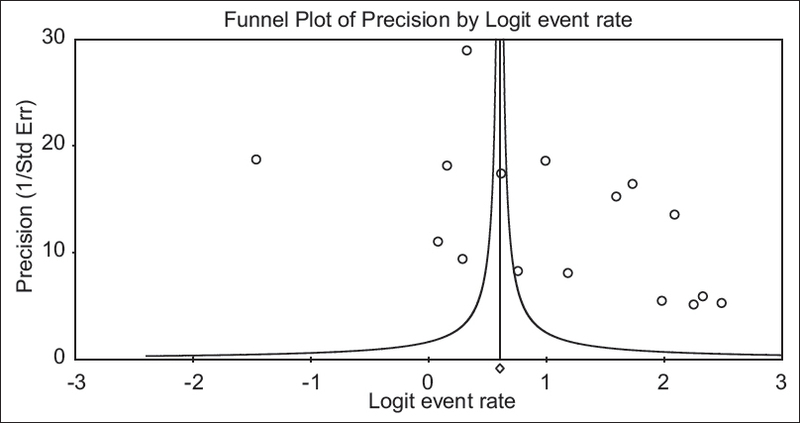 Significance was set at P < 0.05, except for 0.10 used for the heterogeneity (Ioannidis, 2008). Visual inspection of forest plot and Chi-square test was used to test the presence of heterogeneity. 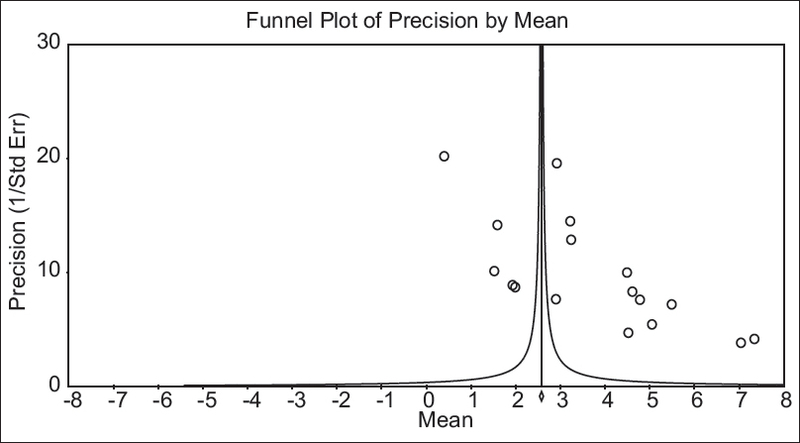 Funnel plot was used to check the possibility of publication bias. A plot of sample size according to effect size must show funnel shape. The results' data of all studies included in the systematic review were compiled into one table. The following data were presented for each study: author or authors' name, year of publication, country, sample size, age in years, mean DMFT and standard deviation, and prevalence [Table 1]. Following implementation of all of the inclusion criteria, 22 studies were included in the systematic review. In four studies, the mean DMFT data were not recorded, whereas in six studies, the prevalence was not reported. The sample size of those studies in permanent teeth mean DMFT was 23,152 children, whereas sample size for the prevalence was 18,699 children. A large proportion of studies were carried out in KSA (12 of total studies included). Bahrain, however, did not have any publication [Table 1]. 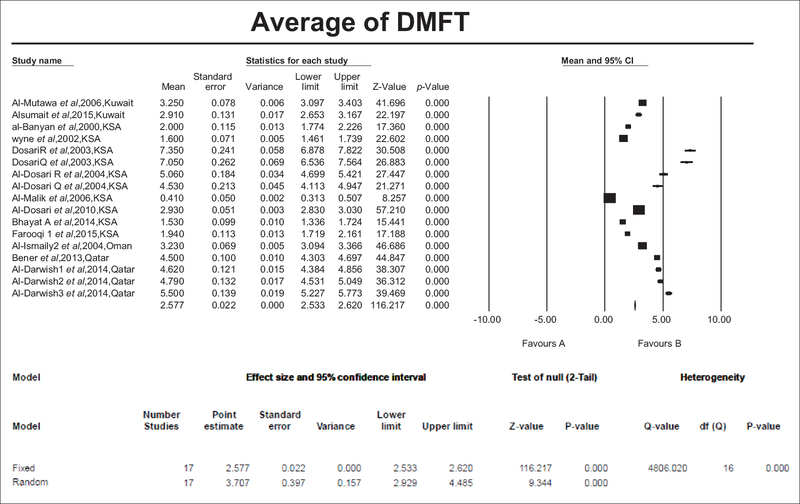 The analysis was again performed over the data set that had mean DMFT values [Figure 2]. Heterogeneity was checked first by forest plot and then by a Chi-square test. Visual inspection of the forest plot and Chi-square (P < 0.001) gave adequate evidence of heterogeneity in the data set, and the index of heterogeneity was also very high Q-value of 4806.020 (df = 16) and I2 value of 99.67%. The random effect model was used to estimate mean DMFT, and this was found to be 2.577 (0.022) with 95% CI (2.533–2.620). A forest plot [Figure 3] shows that the overall estimation of the prevalence in permanent teeth was 64.7% and with 95% CI, the range was (63.9%–65.4%). It is very clear that the width of the CI is very small due a large number of participants in the analysis. A high heterogeneity was found as demonstrated by Q-value of 3,048.074 (df = 15), I2 of 99.5% and P < 0.001. The funnel plots for permanent dentition exhibited clear asymmetry among both DMFT and prevalence studies [Figure 4] and [Figure 5]. There was an asymmetrical profile, especially at the bottom of the plot, indicating the presence of publication bias. Egger's regression statistical test was used for confirmation of publication bias. A significant result (Egger's test P = 0.001–0.003) indicated the presence of publication bias. The study focused on all the articles reporting caries in terms of DMFT and prevalence among school children in GCC countries. Out of the 22 studies which were selected from an initial sample of 193 research papers published and unpublished from 1992 to 2016 met the inclusion criteria and included in the systematic review. Khan  in a meta-analysis study in 23 countries of Arab league from 1999 to 2012 reported that 35 research papers met the inclusion criteria and were included their study. In the current study, the majority of studies were from KSA (12 out of 22). The mean DMFT for the permanent teeth in KSA range was (0.41–7.35) and the prevalence (57.2%–92.3%). The most reported cause was exposure to a cariogenic diet. There were only three UAE studies with DMFT range (1.6–3.27) and prevalence (54%–65%). The education of the parents and improving the dietary habits, good oral hygiene practices like brushing twice a day were the reported reasons for the decreased prevalence of caries over the past few years in the UAE. However, in Kuwait also there were three studies with DMFT range (2.91–3.25) and the prevalence (18.83%–52%). Increasing age with poor oral hygiene was a highly significant association with the risk of dental caries in the permanent teeth. The number of included studies regarding permanent dentition in Oman and Qatar was two studies met the inclusion criteria. In the permanent dentition of Omani children, the mean DMFT range was (1.53–3.23), and the prevalence was 58.1%. The main causes of dental caries reported were poor oral hygiene, plaque and calculus accumulation. In the permanent dentition of children in the state of Qatar, the mean DMFT and the prevalence range were 4.5 and (73%–85%), respectively. One of the most commonly reported risk factor of caries in Qatar was the sociodemographic factor. However, no published studies in Bahrain. The above results clearly showed high caries levels of both prevalence and severity in terms of mean DMFT scores. There was a wide range both in prevalence and severity in different studies. This is in line with Richardson et al. conclusion that the prevalence of caries in children varies greatly in different studies, which may be due to several factors such as: (1) Children studied; their age and the accessibility for examination; (2) socioeconomic status; (3) ethnic and cultural factors; and (4) criteria used for diagnosis. Most of the studies included in the systematic review used the WHO  method of caries diagnosis which is also widely used in international epidemiological studies. It is efficient in detecting dental cavities, but not the noncavitated lesions and this would probably underestimate caries prevalence. Certainly, the inclusion of noncavitated lesions would provide a better estimate of the disease prevalence and severity, which means a better understanding of treatment needs. The WHO criteria of caries diagnosis, however, are still a recognized and valid method in dental caries epidemiological studies, and its use allows comparison between studies. Furthermore, clinical diagnosis of the pre-cavitated lesion in epidemiological screenings would be challenging, especially in preschool children and using radiographs to detect noncavitated lesions for screening purposes would neither be ethical nor practical. The total number of sample sizes of those studies in permanent teeth caries mean DMFT [Figure 2] was 23,152. While sample size for prevalence it was 18,699 [Figure 3]. A large proportion of studies were carried out in the KSA (12 out of 22). The prevalence and severity of caries in permanent teeth from a random effect model were high (64.7%) with (95% CI: 63.9-65.4%) and a mean DMFT of 2.577 with (95% CI: 2.53-2.62). A study by Khan et al. reported a slightly higher mean DMFT of 3.34 (95% CI: 1.97–4.75) in a KSA review of papers published from 1999 to 2008. A higher prevalence and mean DMFT were also reported in KSA children by Al-Ansari (2014) in his 30 years literature review study. The prevalence was 91%, and the mean DMFT was 7.35 in 12–19 years old. Al-Agili in a systematic review reported a slightly higher prevalence and a mean DMFT (70% and 3.5, respectively). However, the mean DMFT of the current study was comparable with that reported by Khan's  Arab League meta-analysis study (2.469 with 95% CI: 2.019–2.919). When comparing the results of the present study and the aforementioned studies on the prevalence of permanent dentitions caries in GCC countries and those from developed countries, it is clearly evident that the GCC population exhibits a higher prevalence. For example, the Child Dental Health Survey 2013 in England, Wales and Northern Ireland reported lower prevalence in 12 years old (34%) and in 15 years old (40%). In the USA National Health and Nutrition Examination Survey (2011–2012), the prevalence of dental caries in the permanent teeth of children aged 6–11 years old was 21%, whereas in the current meta-analysis, it was 64.7%. In 2015, an Australian state study of dental caries of 3186 children (9- to 14-year-old) from 207 schools was carried out. The reported prevalence of dental caries for the permanent dentitions (38.8%), which was also lower than our study. The present study on the prevalence and severity of dental caries over the past 24 years in the GCC countries has shown that the prevalence and severity of caries, both in primary and permanent dentitions, were high and alarming. In 1981, the WHO and the World Dental Federation (Fédération Dentaire Internationale) jointly formulated goals for oral health to be achieved by the year 2000 as follows: 50% of children aged 5–6 years to be caries free; global average of DMFT not to be >3 for 12-year-old children and 85% of the population should retain all their teeth at the age of 18 years. In addition, according to the WHO's basic global indicator of oral health 2000, DMFT >6.6 for the children aged 12 years is considered very high, between 4.5–6.5 is high, and 2.7–4.4 is moderate. It is clear from the results of this study that GCC countries fell short of these goals and recommendations and that caries in permanent dentition moderate. This continuing problem is disturbing not only due to its high burden of caries management costs on the economy of GCC countries but also its negative effects on children's growth, development, and quality of life. Heterogeneity can be determined by visual inspection of the forest plot. If CIs for the results of individual studies (generally depicted graphically using horizontal lines) have poor overlap, this generally indicates the presence of statistical heterogeneity. Higgins (2003) argued that, since clinical and methodological diversity always occurs in a meta-analysis, statistical heterogeneity is inevitable. In this study, additional statistical tests (Q and I) were used to verify the presence of visual heterogeneity. In the permanent dentition also, visual inspection of the forest plot and Chi-square (P < 0.001) gave adequate evidence of heterogeneity in the data set, and the index of heterogeneity was also very high Q-value of 4,806.020 (df = 16) and I2 value of 99.67%. Khan has reported the presence of heterogeneity in permanent dentition studies, visually and statistically, by obtaining a significant Q test value with P < 0.001 and I2 value of >90%. Khan et al. also reported the presence of heterogeneity between studies as indicated by a significant Q-test value with P = 0.00 and I2 value of >75%. In this study, there was a publication bias seen visually by the asymmetrical distribution of studies [Figure 4] and [Figure 5] and also statistically (Egger's test P = 0.001–0.003). Similar results were reported by Khan in his Arab League meta-analysis study (Egger's test P = 0.0.0016). Khan et al. in a KSA study also reported the possibility of publication bias among permanent dentition studies (Egger's test P = 0.018). 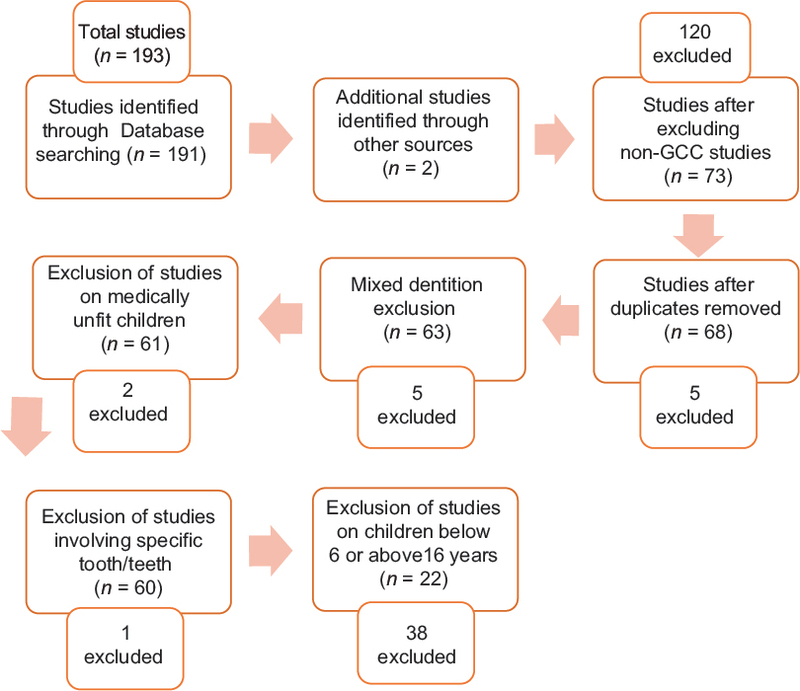 Although this systematic review and meta-analysis study provided valuable information about the prevalence and severity of dental caries in children of GCC countries, it is clear that majority of the studies were carried out in KSA with a few studies in UAE, Kuwait, Oman, Qatar, and no published studies in Bahrain. Furthermore, even in the KSA, most of the studies were conducted in major cities such as Riyadh and Jeddah. Therefore, the current meta-analysis may not be representative of the overall populations in the GCC countries or even within individual countries. However, it could be argued that the participants are all GCC nationals who have similar socioeconomic and cultural backgrounds. Another possible weakness, which is common in most dental caries studies, was the use of different methodologies including sample size, methods of diagnosis and recording, randomization, and type of study. Other inevitable limitations in most meta-analysis studies are heterogeneity and publication bias; the latter was only evident in permanent dentition studies in this meta-analysis study. The prevalence and severity of dental caries in terms of mean DMFT are high in children of the GCC countries. The main reported contributing factors were poor oral hygiene and the consumption of a high-sugar diet. There is important and urgent need to conduct high-quality research studies in all GCC countries, including small cities and rural areas in each country, to accurately evaluate the levels and the extent of the dental caries burden. This significantly assists oral health policy makers in GCC countries to plan cost-effective preventive strategies, especially community-based preventive programs. There should be more emphasis on prevention of ECC because by preventing caries in the very young population will result in lasting beneficial effects on oral health throughout the whole population life. This can be achieved by education of pregnant mothers and parents with young children through close cooperation between the dental and medical professions, especially antenatal clinic staff and pediatricians. This study did not provide a comprehensive picture of caries prevalence and severity in GCC because in many of these countries, only a few studies had been performed. Therefore, additional studies are needed to better evaluate the prevalence and severity of caries in children and adolescence in GCC countries. The principle author would like to acknowledge Julphar Gulf Pharmaceutical Industries for their sponsorship of her Masters of Science training. Ras Alkhaimah, UAE. We applied the “ first-last-author-emphasis” norm for the sequence and credit of authors' contributions. Al-Agili DE. A systematic review of population-based dental caries studies among children in Saudi Arabia. Saudi Dent J 2013;25:3-11. Moses J, Rangeeth B, Gurunathan D. Prevalence of dental caries, socio-economic status and treatment needs among 5 to 15 year old school going children of Chidambaram. J Clin Diagn Res 2011;5:146-51. Kowash M. Early childhood caries-A continuing oral health problem: A review. Appl Clin Res Clin Trials Regul Aff 2014;1:111-7. Featherstone JD. The continuum of dental caries – Evidence for a dynamic disease process. J Dent Res 2004;83:C39-42. Pezzementi ML, Fisher MA. Oral health status of people with intellectual disabilities in the Southeastern United States. J Am Dent Assoc 2005;136:903-12. Farooqi FA, Khabeer A, Moheet IA, Khan SQ, Farooq I, ArRejaie AS. Prevalence of dental caries in primary and permanent teeth and its relation with tooth brushing habits among schoolchildren in Eastern Saudi Arabia. Saudi Med J 2015;36:737-42. Bhayat A, Ahmad MS. Oral health status of 12-year-old male schoolchildren in Medina, Saudi Arabia. East Mediterr Health J 2014;20:732-7. Al-Agili DE, Alaki SM. Can socioeconomic status indicators predict caries risk in schoolchildren in Saudi Arabia? A cross-sectional study. Oral Health Prev Dent 2014;12:277-88. El-Nadeef MA, Al Hussani E, Hassab H, Arab IA. National survey of the oral health of 12-and 15-year-old schoolchildren in the United Arab Emirates. East Mediterr Health J 2009;15:993-1004. Deeks JJ, Altman DG, Bradburn MJ. Statistical methods for examining heterogeneity and combining results from several studies in meta-analysis. Systematic Reviews in Health Care: Meta-Analysis in Context. Vol. 2. London: BMJ Books; 2001. p. 285-312. Borenstein MH, Higgins JP, Rothstein HR. Introduction to Meta-analysis. Chichester: Wiley; 2009. Al-Mutawa SA, Shyama M, Al-Duwairi Y, Soparkar P. Dental caries experience of Kuwaiti schoolchildren. Community Dental Health 2006;23:31. Alsumait A, ElSalhy M, Raine K, Cor K, Gokiert R, Al-Mutawa S, et al. Impact of dental health on children's oral health-related quality of life: a cross-sectional study. Health and Quality of Life Outcomes 2015;13:1. Ali DA. Evaluation of dental status of adolescents at Kuwait University dental clinic. Oral Health and Preventive Dentistry 2016;14:183-188. Akpata E, Al-Shammery AR, Saeed HI. Dental caries, sugar consumption and restorative dental care in12–13-year-old children in Riyadh, Saudi Arabia. Community Dentistry and Oral Epidemiology 1992;20:343-6. Al-Shammery AR. Caries experience of urban and rural children in Saudi Arabia. Journal of Public Health Dentistry 1999;59:60-4. Wyne AH. teachers' oral health knowledge, attitude and practices. Saudi Med J 2002;23:77-81. AlDosari AM, Wyne AH, Akpata ES, Khan NB. Caries prevalence among secondary school children in Riyadh and Qaseem. Saudi Dental J 2003;15:96-9. Aldosari A, Wyne A, Akpata E, Khan N. Caries prevalence and its relation to water fluoride levels among schoolchildren in Central Province of Saudi Arabia. International Dental J 2004;54:424-8. Al-Malik M, Rehbini Y. Prevalence of dental caries, severity, and pattern in age 6 to 7-year-old children in a selected community in Saudi Arabia. The J Contemporary Dental Practice 2006;7:46-54. AlDosari AM, Akpata ES, Khan N. Associations among dental caries experience, fluorosis, and fluoride exposure from drinking water sources in Saudi Arabia. Journal of Public Health Dentistry 2010;70:220-6. Al-lsmaily M, AI-Khussaiby A, Chestnutt I, Stephen K, AI-Riyami A, Abbas M, et al. The oral health status of Omani 12-year-olds–a national survey. Community Dentistry and Oral Epidemiology 1996;24:362-3. Al-Ismaily M, Al-Busaidy K, Al-Khussaiby A. The progression of dental disease in Omani schoolchildren. International Dental J 2004;54(S6):409-10. Bener A, Al Darwish MS, Tewfik I, Hoffmann GF. The impact of dietary and lifestyle factors on the risk of dental caries among young children in Qatar. The Journal Of The Egyptian Public Health Association 2013;88:67-73. Al-Darwish M, El Ansari W, Bener A. Prevalence of dental caries among 12–14year old children in Qatar. The Saudi Dental J 2014;26:115-25. Ur Rehman MM, Mahmood N, Ur Rehman B. The relationship of caries with oral hygiene status and extra-oral risk factors. J Ayub Med Coll Abbottabad 2008;20:103-8. Richard J, Pillemer DB. Summing Up. The Science of Reviewing Research: Cambridge: Harvard University Press; 1984. Khan SQ. Dental caries in Arab League countries: A systematic review and meta-analysis. Int Dent J 2014;64:173-80. Richardson BD, Cleaton-Jones PE, McInnes PM, Rantsho JM. Infant feeding practices and nursing bottle caries. ASDC J Dent Child 1981;48:423-9.
WHO. Oral Health Surveys: Basic Methods. 4th ed. Geneva: World Health Organization; 1997. Available from: http://www.apps.who.int/iris/handle/10665/41905. [Last accessed on 2017 Mar 11]. Holmes R, Porter J, Vernazza C, Tsakos G, Ryan R, Dennes M, et al. Child Dental Health Survey 2013, England, Wales and Northern Ireland. Health and Social Care Information Center; 2015. Available from: http://www.content.digital.nhs.uk/catalogue/PUB17137/CDHS2013-Report2-Dental-Disease.pdf. [Last accessed on 2016 Jul 12]. Dye BA, Thornton-Evans G, Li X, Iafolla TJ. Dental Caries and Sealant Prevalence in Children and Adolescents in the United States, 2011-2012: US Department of Health and Human Services, Centers for Disease Control and Prevention, National Center for Health Statistics; 2015. Do LG, Ha DH, Spencer AJ. Factors attributable for the prevalence of dental caries in Queensland children. Community Dent Oral Epidemiol 2015;43:397-405.
WHO. Oral Health Information Systems. Available from: http://www.who.int/oral_health/action/information/surveillance/en/. [Last accessed on 2017 Mar 17]. WHO. DMFT Levels at 12 Years 1996. Available from: http://www.apps.who.int/iris/bitstream/10665/61182/1/WHO_ORH_DMFT12_96.1.pdf?ua=1. [Last accessed on 2017 Mar 17]. Khan SQ, Khan NB, Arrejaie AS. Dental caries. A meta analysis on a Saudi population. Saudi Med J 2013;34:744-9.